Thank you for all your love and support during this massive storm called Hurricane Florence that inconveniently decided to visit our area and linger. 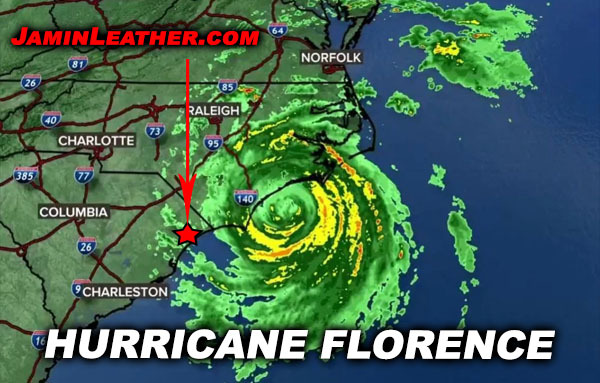 The weather reports for the entire coast were a lot worse than it appeared for the Myrtle Beach area, where Jamin Leather is located and shipping from. The hurricane hit land about 1 hour north of Myrtle Beach in Wilmington North Carolina and has inundated that area with wind and heavy rain. Our prayers go out to all those north of us and pray the storm surge and flooding spare all who are in harm’s way. The original reporting of a category 4 or 5 would have devastated the entire coast but as you can see from the reporting we got lucky. Or at least, a lot luckier than it could have been. The Myrtle Beach coastal areas along with many of the South Carolina, North Carolina and Virginia coastlines were under mandatory evacuation since Tuesday of last week and we must apologize to all our customers for not being available to take your call or reply in a timely manner. We did our best remotely to email all our pending customers with orders affected by our absence. We have since Sunday been diligently mailing everything we can, only to inundate the US Post Office and FedEx with packages that anxiously need to get on their way. Let’s hope they all make it to their destination without incident or extra delay. Once again, we want to thank all who reached out to us, checked in on us and have been praying for us these past few days. God Bless you all and all our customers who have been understanding of our dilemma at this time. We should be fully functional and on target with all our orders in the days to come.